Coming in hot(ish) with my first not-so-bold prediction - the line for UT wins is 8.5, and I'm taking the over. Wow, I know, a true Skip Bayless in the making here. We're days away now, and I wanted to share a few last preseason thoughts on why I think we'll be better with a few thoughts/predictions for each side of the ball. Decided I'd start off with the O-O-O-fense. ^Get it? ha. haha... ha. Regardless, I hope by the end of this post your feelings about our 2018 offense are more similar to Drew's (on the right) and less like Office Space's main character, Peter Gibbons. 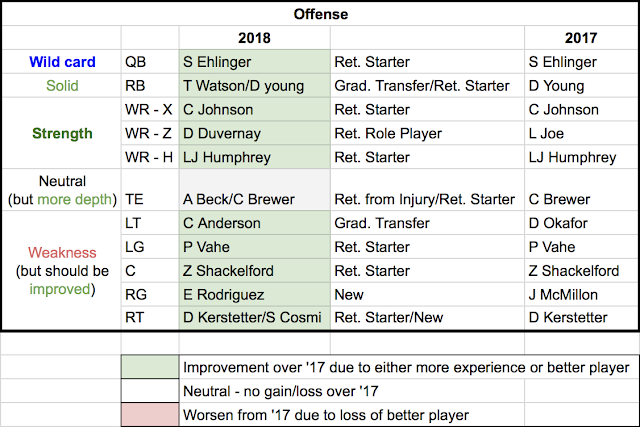 First off, let's take a look at the predicted starters for Saturday's game versus starters from last year (taken from the depth chart against TCU). Takes the defender 5 yards into the end zone. He's going to be good, but even if he's just pretty good, we still have Daniel Young, who had a solid finish to last season. Also, 4-star true freshman Keontay Ingram has been showing enough nice flashes in practice to be RB3. I also think WR will be our strength on offense. Seems kind of odd to say, but I think Collin Johnson and Lil J Humphrey are future NFLers, and I'm not so sure about anyone else. Yes, I did write about how I think Collin Johnson needs to rebound last week, but I still think he has star potential. Also, LJH - the guy just gets open, makes good catches, and has great run-after-catch abilities, especially for a big guy. And did you see him in the short yardage package in the Spring game? Second not-so-bold prediction, Lil J will lead the 'Horns in TDs this year with 12+ TDs (5 receiving and 7 rushing, at least). Here's a nice display of his hands. Remember, he was a RB in high school, this guy is just going to get better and better. This was his second short yardage rushing TD of the Spring Game. Definitely an improvement from adding more unnecessary hits on your QB. Actually, before I move on from LJH, I do have hot take, or actually bold prediction. After LJH leads the Horns in both receptions (though CJ will lead in yards again) and rushing TDs, thus total TDs, he will be in the top 5 in voting for Heisman in 2019 as the Horns leading WR and goal line RB. Think about it, when was the last time you saw that at the NCAA or NFL level. Finally, let me explain why I noted our QB as a wild card. I think there is such a wide variance for how this season will play out for him. On the very positive side of the spectrum, he could lead us to a 10+ win season and enter next year with justifiable talks of being a Heisman hopeful. On the flip side, we might be pumped for Cameron Rising next year (who is getting much praise of his own, but will likely redshirt this year). - Sadly, my last not-so-bold prediction is that Sam will end up with the most carries on the team again. He had nearly 30 more than the top RB last year. And, considering the coaches will likely split carries among 3 RBs AND over-run Sam, unfortunately. 2. For Sam, get more comfortable and accurate as a pocket passer. He completed 57% of his passes compared to Shane's 64%. I'd love to see Same stay above 60% this year. Also, he seemed to miss too many easy throws either looking for the big play or just not reading defenses well enough. See here: Just throw the quick out and don't take an unnecessary hit! However, here's an example of him making a nice accurate throw over the middle. He has it in him, and I know he needs better protection to make him trust staying in the pocket more. Forgive the lack of copyediting. Ain't nobody got time fo dat. Nice adjustment. Thanks applying my advice. Much better.